Crawley Town fell to promotion-chasing Portsmouth as two second-half goals sealed the defeat. Paul Cook's side went ahead in the 54th minute when Christian Burgess headed in from a ball from a corner-kick awarded after Glenn Morris had again saved a penalty. The visitors continued to press and added a second on 72 minutes scored by former Crawley Town winger Kyle Bennett. Reds made one change to the side which held Doncaster Rovers to a draw, with Rhys Murphy coming in to make his first start in his second spell at the club in place of Billy Clifford who was on the bench. Portsmouth made two changes with Carl Baker and Danny Rose replacing Gary Roberts who was bench and the injured Amine Linganzi. Pompey were buoyed by a constant barrage of noise from their massive 2,300-strong following. The visitors had the best of the opening exchanges, with Matt Clarke shooting from outside the area straight at Glenn Morris who got down low to save comfortably. A cross from the left towards Carl Baker failed to connect and the ball sped out of play. Pompey's Bennett crossed from the right to Rose who launched another shot from just outside the area, which was again easily caught by Morris. Eoin Doyle forced a block by Morris in Portsmouth's best chance of the first half when he was put through. Crawley had a chance just before half-time as Murphy audaciously volleyed wide. Morris was again the hero early in the second half as he saved a penalty for the second time in two matches to deny Eoin Doyle after Josh Lelan tripped Enda Stevens. However the jubilation from Crawley's fans was shortlived as seconds later Portsmouth took the lead. From the ensuing corner-kick,Burgess headed home a goal. In the meantime good work by Crawley's Enzio Boldewijn supplied Josh Payne who blasted over the bar. Pompey continued to pressurise in search of a second goal and Carl Baker and Doyle both had shots blocked. Portsmouth's pressing then bore fruit with 18 minutes to go when Bennett cut in from the left and scored with his right foot. 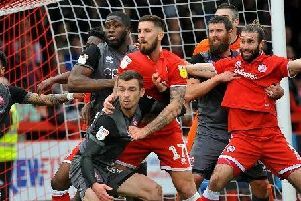 James Collins went close for Crawley in the closing minutes with a nice glancing header which was narrowly wide from Billy Clifford's corner-kick.